1000 miles! If we had predicted such an advance to Jean-Luc van den heede after 70 days of race, he might have had a hard time believing it. Tapio Lehtinen and istvan and would also have had a lot of difficulty imagining that they would be less than a thousand after the same number of days, after very different trajectories... such a long race must necessarily have surprises, good or bad, She dives sailors into an ocean of uncertainty, she tests their endurance, envy, physical resistance, mental resistance especially! At Almost 7 Knots, after a small slowdown (very appreciated) this weekend on the edge of a high pressure zone, the leader and Dean of the race found a good pace, in favourable conditions, wind From North-West to three-quarter and a reasonably trained sea. 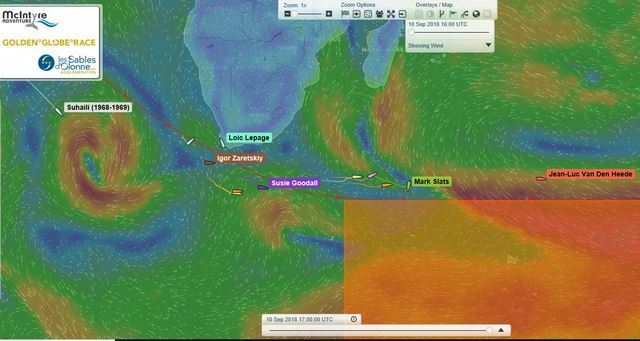 Far behind (1000 miles so), Mark Slats managed to escape for now to a band without wind that will not have time to block the road of Gregor Mc Guckin, Abhilash Tomy and uku randmaa, respectively 150 , 300 and 400 miles in his wake. BUT THE DUTCH GIANT AT 5 knots for now should see this one catch him up in the day and face again, once again, to low winds of face in a messy sea, very uncomfortable, as we find Only in the Indian ocean... behind, the formation of a new band of high pressure could this time pick its direct pursuers from the south before strong South-West winds grow them again tomorrow in the middle of Noon. For Susie Goodall, 6th, progress is made at the door, at almost 6 knots. Almost 750 miles behind uku randmaa, she led the second group of the pursuers, 200 miles ahead of tapio lehtinen and istvan and who had the surprise to see each other! All three are also threatened by a bubble without wind in training which, if not, will soon generate winds of face, slowing down further progress, and they will have to wait another two days before finding a favourable flow. But they're less to complain than Igor Zarestskiy and Mark Sinclair. Respectively at 2600 and 2850 miles from the leader, they are entangled (1,5 and 2,2 knots respectively) in calm that should last until tomorrow night, before there also generate winds of face... And then find a good wearing. As for loic lepage, he arrived at Cape Town Friday night, where he found are wiig! No doubt the breton sailor had to appreciate breaking his loneliness and sharing with his unfortunate colleague. He will leave Wednesday in Chichester Category.